New Model FMLA Notices & Medical Certification Forms are now available on the gov website. The content of the notices and certifications has not changed; just the expiration dates, extending to August 31, 2021. Nevertheless, make sure you start using these new forms immediately. New DOL Office: The U.S. Department of Labor (DOL) has announced the creation of the Office of Compliance Initiatives (OCI), and unveiled two new websites, gov and employer.gov. The new websites and the OCI are designed to assist workers and employers that have compliance questions. My quick look at the sites revealed that they have helpful information worth using as a resource if you have a question. Affirmative Action Program Verification Initiative: The OFCCP issued a Directive August 24, 2018 with the objective of ensuring that all covered federal contractors are meeting the most basic equal employment opportunity regulatory requirements, namely the preparation of a written affirmative action program (AAP) and annual updates to that program. At least in part, the concern was raised due to the fact that close to 85% of contractor establishments did not submit a written AAP within 30 days of receiving an audit scheduling letter, as required. Hmmm…the OFCCP will prepare a public outreach and education campaign on this initiative, to include encouragement of contractors to contact the OFCCP for compliance assistance. I have often mentioned in this newsletter how challenging FMLA is for HR to track, and for operations folks to manage a workforce with some employees interested in abusing FMLA. 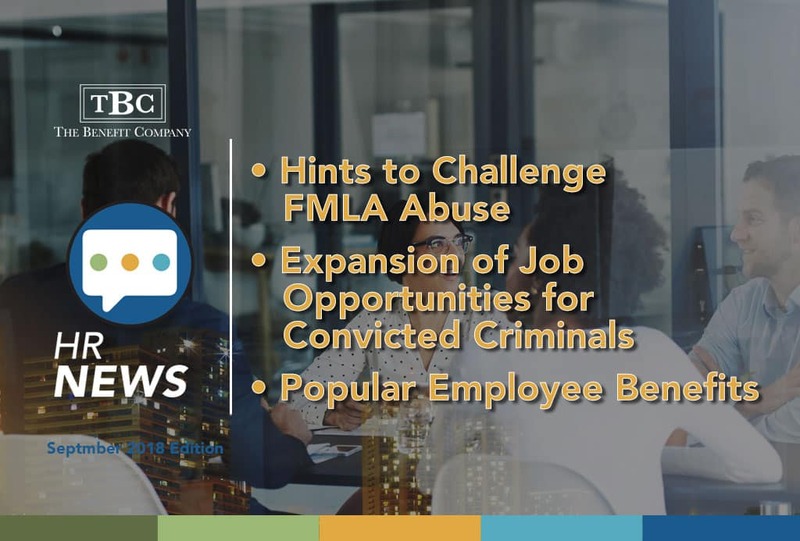 The good news is that there are some tools in the toolbox that employers can legally use to fight FMLA abuse, but they do require some attention and definitely require consistent application. Take a look at those listed below, and see if any might be manageable in your company. Written Leave Request: Consider having a policy requiring that all leaves of absence, for any reason, require a written request. You will still have to honor a verbal FMLA request if there was an unusual circumstance as to why they could not follow your company procedures, but this can be a deterrent to abuse. Enforce Call-in Procedures: You should have a policy outlining when the employee should report any absence (one hour prior to start of shift? ), to whom the report should be made (only to supervisor? ), in what manner (is text OK? ), and what the call content should be. Require Medical Certification: Make sure that an employee requesting FMLA for a serious health condition has provided you with a complete medical certification. If there are unanswered questions, or unclear answers, provide your employee with a written request of the specifics you need their doctor to provide. Personal Certification for Leave: This is something that was recently brought to my attention, and I thought it was an interesting idea. Upon return from a leave, ask the employee to complete a personal certification asking that they confirm they actually took the leave for the reason provided on their leave application form. If you find they were not truthful (e.g., abusing FMLA), they may be disciplined for falsifying documents. Check in with Employee: Tell your employees that while on a leave, you will be contacting them to stay apprised of their status. Make sure you do it! Patterns of Absence: Make sure that if you notice a pattern of absence, such as long weekends, or extended holidays, that you follow-up with your employee to confirm their FMLA status. Scheduling Medical Treatment: Employees are required to consider the needs of the employer’s operations in scheduling medical appointments, when at all possible. Don’t just accept that a 10am physical therapy appointment is the only one available, if it totally disrupts the work schedule. FMLA management will always be challenging, but implementing some of the practices above may help your workplace run a little more smoothly. What can be so bad about having the lowest unemployment rate in decades, in the U.S.? Not being able to fill your job openings, that’s what! To help expand the pool of prospective applicants for jobs, a number of states are allowing employers some relief from the liability of most employment-related negligence claims when hiring or retaining a person with a criminal record. Each state that has implemented or proposed such relief is handling it a bit differently, so employers should use care to make sure they understand their state’s law, if there is one. For example, in our July 2018 newsletter, I mentioned that NC Governor Roy Cooper signed a bill allowing individuals convicted of certain crimes to petition for a “certificate of relief.” This is not an expungement of a criminal record, or a pardon, but provides employer relief. The NC law goes into effect December 1, 2018, and applies to petitions filed on or after that date. In response to the tight labor market and with the backing of prominent business groups, SC Governor Henry McMaster jumped on the bandwagon by recently signing a bill allowing certain criminal records, including pardons, expunged following a successful court petition. Among other things, this means that a prospective employee would not be required to disclose on an employment application criminal record information that has been expunged. Convictions for juvenile offenses, first offenses and relatively minor drug offenses would be among those crimes potentially eligible for expungement in SC. The law applies retroactively to offenses committed prior to the law’s passage, but it requires a person’s record to be clean for at least three to five years, depending on the crime, before the person may apply for expungement. The benefit to employers is immunity from civil action for hiring a worker with an expunged criminal record. This new SC law goes into effect December 27, 2018. The tight labor market is creating challenges for most employers. It is a time requiring maximum creativity by employers to attract and retain enough qualified employees to meet their needs. Benefits provider Unum recently conducted a worker poll, asking which non-insurance or retirement benefits are most desired by employees. Much has been written lately about student loan repayment, identity theft coverage and pet-friendly offices, but it seems what workers really want is…. to not work! Time away from the workplace is the most coveted employee benefit. If you are the parent of a millennial, you employ millennials, or if you know a millennial, you will not be surprised to learn that they, in particular, want time to do things other than work! Paid family leave, flexible and remote work options, and sabbaticals top the list in Unum’s survey. Professional development was also near the top of the list. Perhaps these benefits are some to consider, as you make your workplace more attractive to the increasingly limited pool of job applicants.